Arrive at Entebbe airport where an Aerolink staff member will assist you with the check-in and transfer to your domestic flight to Kasese. 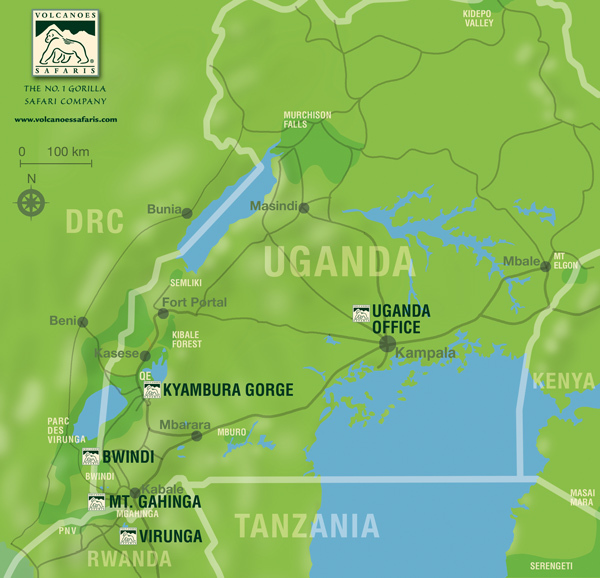 Upon arrival at Kasese you will be welcomed by your expert guide who will provide knowledge and assistance throughout your journey. Opt for an early morning or an evening game drive for the best opportunity to see game. What you see depends on the season, but the Kasenyi plains are excellent for sighting lion and large herds of Uganda kob. In the afternoon you can opt to visit various Volcanoes Safaris Partnership Trust-supported community projects such as a women’s coffee cooperative, wetland reclamation project, an omumushaka dance group performance and much more. In the afternoon take a cruise on the Kazinga Channel, which flows between Lakes Edward and George. The Kazinga Channel is home to one of the greatest concentration of hippo in Africa and herds of elephant, buffalo and other animals come to drink at the waters edge. Transfer from Kyambura lodge to the Kasese airstrip. Leave with the morning or afternoon return flight to Entebbe and connect in time for your international flight.